This giveaway is now closed. Thanks to everyone who commented. I remember specifically where I was when I received an email from Krista, asking whether I wanted to be part of a book with projects related to quilting retreats--Mark and I were at the central coast of California for a weekend, walking into the theater to see a movie one afternoon. I could hardly wait to reply to that email. Yes, yes, yes!! Krista and I have been blogging friends for quite a few years. I was this close a few years ago to being able to attend her famous Loon Lake retreat; it was so disappointing when it didn't work out. We finally met at QuiltCon in February and I was able to meet several other contributors as well. It was one of the biggest highlights of QuiltCon. My contribution to the book was a little sewing mat for under your machine, with pockets to keep items handy when you are limited on space. Not surprisingly, it is made from selvages! There is also a little story about my most memorable retreat experience. This week it was fun to make a couple of other projects from the book. First up was Ayumi's tote bag. I have been sewing from my stash as much as possible this year so it was really fun to finally use this Alexander Henry fabric that has been on a shelf for a couple of years. Just waiting for the right project to show it off in all its glory, I guess. :) Strip piecing is used for the bags in the book but it was really easy to make it from a single fabric. Naturally I couldn't resist adding the selvage at the bottom. Next, I made Amy's scissor keeper. And learned a new skill--a magnetic snap. Easy peasy, especially using this tutorial. Krista did a fabulous job with this book and some of my very favorite people have contributed projects. There are projects that will keep you and your supplies organized, along with more projects to make during a retreat or when sewing with friends. I really hope you will take the time to visit all the stops along the way. Friday, April 3 Blog hop kick-off: Krista at Poppyprint. Wednesday, April 8: Martingale Inc. at Stitch this! 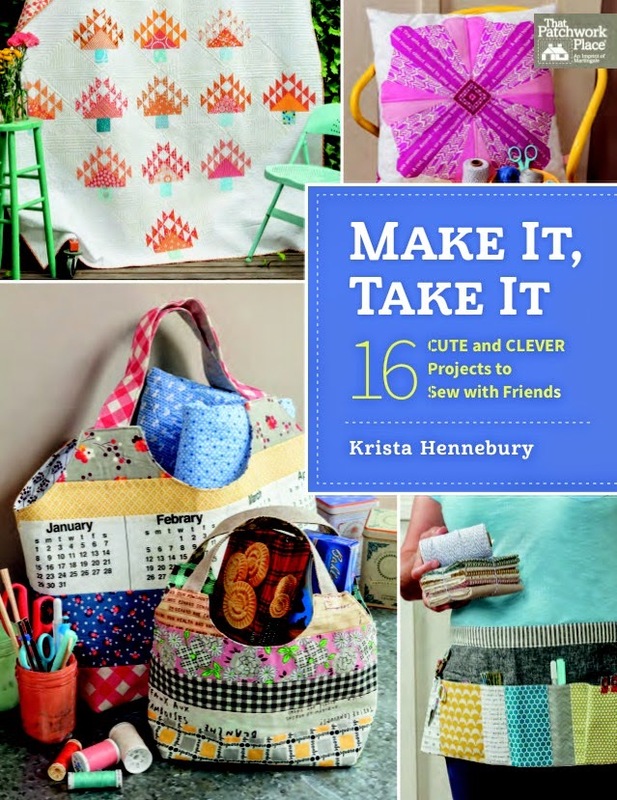 And now the exciting part: you can win your very own copy of Make It, Take It! Two books will be given away: one digital copy (courtesy of Martingale, the book's publisher) and one hard copy (courtesy of me). Just comment on this blog post. And let me know if you have ever attended a retreat (make sure you aren't a no-reply commenter, because if I can't reach you, then the Random Number Generator will have to choose someone else). I'll close this post to comments on Monday at 6 p.m. Pacific time. International entries are welcome. ETA: The winner of the digital copy is lindawwww who said: I haven't been on an official quilt retreat but I went away with two friends for a quilting weekend and had a great time. The winner of the hard copy is Terri who said: Congratulations on having a project in this book! I love love love your project, which would be very handy to make for taking to retreats. I only go to one retreat a year, and this will be my 6th year with those same ladies! Cute! I've never been to a sewing retreat but they sound great! I have never been to one but it sounds like so much fun! Beautiful projects you have made! My first, ever, quilting event was a retreat with the two Australian designers Gail Pan and Helen Stubbings. A weekend with those to gals was an awesome experience, I had so much fun and learned a lot! I have wanted to go on a quilting retreat, but never have. One day...love the sewing mat! Perfect way to 'keep it all together'! I have never attended a "real" Quilting retreat, but have done some marathon sewing with friends. The book looks awesome! Super projects - congrats for your inclusion in the book! To answer your question, I have never attended a retreat. I don't think I ever will because I am deaf and it's all kinds of awkward for a girl like to attend a retreat even though I am completely oral (speak and lip read). I have never been to a retreat, nor do I plan to go to one. I have a small child with special needs. I don't see it possible. I have been to quilt shows and classes but never an official retreat. I hope to go to one someday though. I have been to one only and that was one of Krista ' s day retreats. I LOVE retreats. A group of friends go to a special retreat annually - a wonderful time of sharing tips & tricks, getting free times to quilt, sharing stories of family & faith, bonding closer as friends. Your mat is such a clever idea - thanks for sharing your talent. I haven't been to a retreat yet. They sound like so much fun. Love the sewing machine mat you made for the book! I have been wanting to make one. Thanks for the chance to win! I love your bag, I've got way too much of that special fabric that need to use in something can see often. Hello Cindy, it's so nice to meet you. I've been looking to make something w/all these selvages I've been saving:) Love the sewing machine caddy...and I don't have one of those, right on time. Retreat? No, however I love getting together w/a few sewing quilting sisters and absorbing all their creative energies. Thank you so much for sharing yours! Love your project from the book Cindy! Guess we know I've attended lots of retreats and never looked forward to one more than the one coming up in July! I love attending retreats. Since I have a growing 3 yr old and work full time any time I can steal away and have a few days of uninterrupted time to sew with friends and in a place where they make the food is like heaven! I would love to win a copy of this book. Your little mat looks awesome. I've never been on a retreat but I hope to some day. Thanks for the chance to win! I have not been before, but would love to go! I love retreats - I can usually get lots done on one and learn something new along the way! Love the use of selvedges! and that scissor keeper is so cute! What cute projects! Yes, I`ve been on several retreats and love them! I have not attended a retreat but have one planned for later this year. Oh... I miss quilt retreats. Love your projects! I have only attended day retreats, but they are so much fun! Thanks for the giveaway of this wonderful book. No, I have not had the pleasure of attending a retreat. Maybe someday I will get a chance....they sound like a lot of fun. I have yet to attend a retreat although I have been to one day events. Love the companionship, the sewing and the food. I've been to several retreats and they are great. I always seem to get more accomplished there than at home. I have not been on a retreat but would love to. I think it would be fun to sew all day long and not have any interruptions! And enjoy the company of fellow sewers! Retreats are great- so much fun! I can be very productive at retreats, surprisingly enough! Unfortunately I haven't had a chance to attend one yet. Hopefully some day! I haven't been on an official quilt retreat but I went away with two friends for a quilting weekend and had a great time. So sad to say that I've never been to a retreat :( Maybe some day! I love the sewing machine mat, so handy! Years ago I went on a cloth doll making retreat. We had a lot of fun and were so productive. I love attending quilt retreats and I always get a lot of projects completed. Thanks for the chance at the wonderful book. These projects looks so fun ! I love going to retreats because I can get a project done and it's great to visit while you sew! Love your projects, and would love to find the fabric with the words on it. I have seen it used in other things you have made. I haven't been on a retreat yet but maybe someday. No retreats for me as I'm a self taught quilter. But I have taken some craftsy classes lately and found them good. I'd love to try a retreat as sit is somewhat of a quilting tradition. I love your bag. The fabric is super. I haven't been to any retreats, per se but have been to multi-day classes....does that count? Haven't been on any retreats but looking forward to learning from Krista on our upcoming Quilt Cruise to Alaska! Congratulations on your contribution her book! I've never been able to attend a retreat, maybe someday! Thank you for the chance to win a copy of the book! Sadly I have never been on a sewing retreat! And I always sew alone too! I love the sewing mat! I have one under my machine that I made over twenty years so maybe it's time for a new one, especially if I was lucky enough to win one of these books! I've not been on a Retreat. I,m enjoying the book tour. I have never had the opportunity to attend a retreat but they sure sound like a lot of fun. Love the tote and the selvage touch at the bottom. When are we having a MCM retreat? I've never been on a retreat but they sound like a lot of fun. I'd like to try it sometime with a girlfriend or two. I liked your sewing machine apron the best. It would certainly keep all my materials from being in several place when I start to quilt! I've never gone to a retreat, but I wish I could. I'm an introvert and I'd be very uncomfortable going with a group of people I don't know. As an acceptable measure, I quilt every week with a friend. One glorious year, 3 women and myself quilted together. I love all the projects in this book! I have never been on a sewing retreat, but I know I would love it! I have not been on a sewing retreat. I sounds like a lot of fun. These look like so much fun! Yes, I've been on retreats. Usually we go from Th to Sunday so we get three full days of sewing. I would love to win a copy of this book, so many great projects! Yes, I've been on retreats and love them! It's so much fun to get away and be with friends. I'd love to win this too! I Love this machine mat! I have not been on a sewing retreat. Thanks for the giveaway. While I've been to many sewing/quilting classes, I've never been to a quilting retreat. It is definitely on the bucket list. This scissor keeper looks really good, and a magnetic snap is one of the things I have yet to try. I have never been on a sewing retreat before, maybe that's why I haven't ever done a magnetic snap! LOL Thanks for the chance! I will be leaving on the 16th for a four day retreat. I go twice a year to the one sponsored by my LQS. I want to make the scissor keeper and the ruler tote. I adore your selvege work! It has been 30 years since I attended a retreat. Think it is time for another! Tomorrow is our guild's "Quilt 'til you Wilt". A day long quilt fest with a dozen or so people. It's a good size and great fun. It's nice to see what others are working on and they're always ready to help if I get stuck on something. Thanks for the giveaway. What terrific projects! I'm looking forward to winning one of these books. Your selvege work is inspiring! I have been twice to our guild's retreat and am looking forward to going again. There is nothing better than sewing to your heart's content surrounded by friends! Yes, I have been to a retreat and it is great fun to visit with like-minded quilters and create at the same time. I have not been to a quilting/sewing retreat. It sounds like a great time - I shall put that on my bucket list. I am loving all the great projects in this book! Thank you for the link to the magnetic snap tutorial. I am currently making my first purse and this tutorial is perfect. I haven't been to a quilting retreat, only to quilting/sewing classes. Thank you for the giveaway opportunity. Unfortunately, I've never had the pleasure of attending a retreat. They sound like so much fun, but I've never heard of any in the San Diego area, and I'm limited physically from doing to much traveling. Would love to win the book! I haven't ever attended a retreat ... but if I did, I'd definitely want these projects with me ! :) Thanks for the giveaway! Every October my sister, her daughter, and I hold our own quilting/sewing/crafting retreat in Sedona, AZ for 3 days. We work on projects, watch movies, go shopping, eat at our favorite spots, and sometimes have a big adventure. It's a relaxing 3 days. Your machine mat is fantastic! And the selvedges make it extra special! I've only been on one day retreats but they are great fun: lots of sewing, chatting and eating. I haven't ever attended a retreat, but I'm booked in for my first one in September. I'm really looking forward to it. HELLO, no i have not; sounds fun though! HAPPY SPRING! THANKS FOR SHARING! What a fun print you chose for your lovely tote! And the scissors keeper is super cute too. Looks like a really good book with lots of wonderful projects! I have never been on a sewing retreat but I would like to. I love all the projects you made, especially the scissors holder. b.j.day68@gmail.com. I've never been to a retreat but it sounds like such fun! Love your mat, scissor keeper and tote :) This book is definitely on my 'must have' list! I really like your sewing machine mat. It is so clever. I have yet to make it to a quilting retreat. I like short retreats these days. Somehow old age has set in and I want to be at home. The best part is friends and learning new things. What a fun book! I attended my first quilt retreat in 2010. I had no clue what to expect, packed to many projects, was disorganized, but I still enjoyed myself thoroughly!! Since then I have learned to streamline things a bit for myself, pre cut at least 1 thing or project,take something to do mindless or improv sewing if I am in a funk, and have something new to share. This book looks great. I am sending a link to all of my quilting buddies!! I've never been on a retreat but they sound like fun! Love all the projects you've made from this book. You know I love sewing retreats! I hope that someday I get to sew with YOU! Thanks for the chance to win a copy of the book. Never been on a quilting retreat...but I have un plugged the phone (turn it off now) bared the door, made up a big crock pot of soup and sewed all weekend.... dose that count? No, I've never had the time to days away from home on a retreat. A day or half=day class is more my speed. Thanks for the giveaway. I just returned home this afternoon from my 3rd retreat, ever. I'm addicted. I'm exhausted, but it was SO worth it. No I've never been. I'd want to bring my entire sewing room. Impractical I know! Nope, I've never been on a sewing retreat, but I would jump at the chance to go! To sit, chat and sew with like-minded people would be a dream come true! I've never been on to a sewing retreat, but I'm thinking I would like to one day. Maybe when my kids are bigger. I love Empty Spools at Asilomar! Thanks for the chance! I love quilting retreats!! I can sit and sew all day and listen to many different conversations and feel soooo happy!